Now that technology is so advanced, it’s hard to believe businesses relied on fax machines, snail mail and hard-wired phones for so long. Customers are increasingly tech savvy and mobile, and they expect instant gratification—or, at the very least, lightning-fast response times. So businesses that are stuck in the past tend to lose out on potential clients who are not willing to wait. Cloud-based solutions offer a number of valuable benefits for professional photographers, who are often traveling or working multiple jobs. ShootQ allows them to access all of their data in one place, from anywhere via the web or their mobile phones. It gives them the flexibility to not be tied to a desk or buried under mounds of paperwork. Time management and efficiency are important in any business, but especially for professional photographers, who are often on the go and working at events with strict timelines. This flexibility also ensures that Leeann Marie doesn’t lose potential new clients if she is on a job or out of town, because she is still able to respond quickly to inquiries. If people have to wait, it gives them the opportunity to change their minds or go somewhere else. 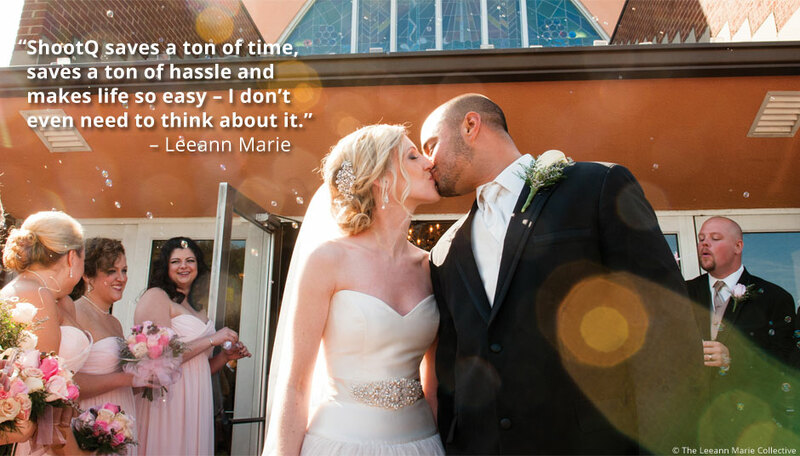 Flash-forward five years, and Leeann Marie has a thriving full-time professional photography business. She relies on ShootQ to create and send contracts to her clients; manage workflows; assign tasks to her colleagues; handle invoicing; and generate questionnaires and automated emails. Her colleagues are setup as photographer users, so they can easily collaborate – they get emails for job bookings, review questionnaires and access contacts.